As profits and readership declined rapidly over the past decade, causing immense disruption in the industry, newspaper empires built in the 20th century fell, and a new type of newspaper owner rose to power. Some of the largest newspaper companies today did not exist in 2004. Private equity funds, pension funds and other investment partnerships have moved quickly to acquire hundreds of distressed papers. They’ve purchased entire chains that have been forced into bankruptcy, as well as smaller private newspaper companies whose longtime owners have given up struggling to adapt economically and technologically to the digital era. Today, seven of the largest 25 newspaper ownersiii are investment groups. Their recently established empires are surpassing in size the large chains of the 20th century, and they are still growing as they continue to snap up more and more ink-on-paper newspapers at bargain prices while disposing of unprofitable ones. Unlike the local owners of the past who had a stake in their communities, or the professional managers who ran those large 20th century chains, these new newspaper owners focus almost exclusively on driving the performance of their holdings, of which newspapers are often a small and expendable part. The decisions that these new newspaper owners make and the business strategies they pursue over the next few years will determine whether these newspapers survive and in what form. iii “Largest” is determined by number of newspapers owned, not total circulation. Over the past century, there have been three types of newspaper owners. The founders, who established iconic newspaper brands such as The New York Times or the Chicago Tribune, dominated the industry in the first half of the 20th century. They were succeeded by corporate newspaper managers in the second half of the century who built large chains, including Gannett and Knight Ridder. Now, in the last decade, investment entities, run by financial portfolio managers, have quickly assembled newspaper groups that dwarf the big chains of the 20th century. Newspapers in this country are equal parts business enterprises and civic institutions with special constitutional protections. With each generation of newspaper owner, there has been debate about how to prioritize obligations to the public versus those to major shareholders. The newest generation of media barons — the investment portfolio managers — are not journalists nor do they share journalism’s traditional civic mission. Their priority is maximizing the return on the assets in their diverse portfolios. Therefore, their rapid ascent raises new and pressing concerns about the responsibilities of newspaper owners in the digital age. A technological innovation in the 19th century, the steam-powered printing press, gave rise to the first generation of newspaper barons. It allowed newspapers to print and distribute their newspapers to mass audiences, which, in turn, attracted the attention and dollars of advertisers who paid to reach these readers. In the era before radio and television, many newspaper barons amassed great wealth and often wielded tremendous political influence. William Randolph Hearst and Joseph Pulitzer, competing in the era of “yellow journalism,” famously used their big-city newspapers to inflame passions leading up to the Spanish-American War. Times and then The New York Times, or the Bingham family, which owned the Louisville Courier-Journal, worked to establish a reputation for editorial excellence and fairness. In the process, these early newspaper barons established the modern, multi- subject newspaper and became the dominant advertising option for most local businesses. Professional managers held most of the executive positions in the large newspaper chains that arose in the latter half of the 20th century. But, in contrast to many other corporations, the newspaper business remained largely a family- centered enterprise. The large chains bore the name of the founders—Gannett, Lee, Knight Ridder, Dow Jones—or the name of the flagship paper—Advance, The New York Times, the Tribune. Often, descendants of the founder held the top posts of publisher, editor, CEO or chairman. Between 1960 and 1990, another trend emerged: One after another competing paper in communities across the country ceased publication. In an effort to preserve “diverse” viewpoints in major metro areas and save the surviving newspapers, the Department of Justice often approved joint operating agreements that allowed two competing papers to merge business operations. But in the small and mid-sized markets, only one newspapers usually survived. These papers became de facto monopolies, the prime source of news in their communities as well as the only viable advertising option for local businesses. At many such newspapers, profit margins soared to 20 percent and even 40 percent. The large chains competed with one another to acquire these papers. Some large companies — such as Hearst and the Newhouse/Advance group — chose to remain private and financed their acquisitions either through debt or profits from their own newspapers. Several big-name newspaper companies — Gannett, Knight Ridder, Lee, McClatchy, Pulitzer, Scripps, Dow Jones, The New York Times and The Washington Post — raised capital for acquisitions by selling stock on either the New York or American stock exchanges. Some bought television stations and magazines, too. By 2000, chains owned more than 90 percent of all American newspapers.13 Most privately owned chains — for example, Shaw Media and Boone — were smaller than the publicly traded chains and typically confined themselves to a specific geographic region. The transition to the current generation of newspaper baron began in the 1990s. The newspaper industry recorded historic levels of advertising revenue, profitability and circulation in the 1980s and 1990s.16 Seeing that newspapers produced a steady and reliable source of income, institutional investors — including hedge and pension funds — bought shares in publicly traded newspaper companies. The financial crisis and Great Recession of 2008–2009 exacerbated the already considerable economic woes of newspapers. With newspaper valuations at historic lows, hedge funds, private equity partnerships and publicly traded investment entities began snatching up hundreds of properties, mostly in small and mid-sized communities. In 2004, the legacy chains of the 20th century still dominated the list of the nation’s largest newspaper companies. By 2014, a mere decade later, they had been supplanted by the investment groups that had grown overnight by purchasing distressed legacy companies. The once-passive investors had become full-fledged owners and operators. As if to distinguish themselves from the iconic newspaper chains of the previous century named after their founders, these new media barons adopted corporate-sounding names—New Media/ GateHouse, Digital First, BH Media, Civitas, 10/13 Communications. Few in the top management ranks had journalistic experience or passion. They viewed newspapers as investments—one of many in their portfolio of businesses. iv Newspapers have historically been valued based on the financial benchmark EBITDA, which stands for “earnings before interest, taxes, depreciation and amortization” are deducted. The net income figure listed on a company’s financial statements includes payments and deductions for these items, which can fluctuate widely year to year. Therefore EBITDA is considered a more reliable measure of a company’s operating efficiency over the long term. In the late 1990s, as newspaper profits soared, several privately held investment firms began to quietly purchase small newspaper chains as they came on the market. By 2004, two of these companies had accumulated more than 300 papers between them and had become the second- and fourth-largest chains in the country, in terms of number of newspapers owned. However, most of the papers they owned were in small markets, so their arrival went unnoticed by industry professionals and analysts, who focused on circulation in determining the biggest newspaper companies. Using circulation as a yardstick, the chains assembled in the latter half of the 20th century — Gannett, Knight Ridder and Advance, among others — still topped the list. The size and span of influence of newspaper companies can be calculated either in terms of total circulation or number of papers owned. Until recently, the newspaper industry has largely used circulation as the primary standard. And yet, in assessing the reach of newspaper owners across many communities, the number of papers controlled is an equally important measurement. In a city of 100,000, for example, a newspaper owner would have roughly the same influence whether its publication had circulation of 20,000 or 30,000. Meanwhile, an owner of four newspapers with 5,000 circulation in four towns would have influence in each of those localities, even with circulation below the newspaper in a mid-size city. With circulation as a measurement, big-name, well-recognized companies founded in the 20th century dominated the field in 2004. Three of the largest five companies — Gannett, Knight Ridder and Tribune Co. — were publicly traded. They had combined circulation of 14.6 million. The third- and fifth-largest chains — Advance Publications and MediaNews Group — were private companies. They had a combined circulation of 6.8 million. The 10 largest companies had a combined circulation of 30 million, or more than a fourth of the total circulation in the country. When the number of newspapers owned is used as a measurement, instead of circulation, a very different picture emerges. 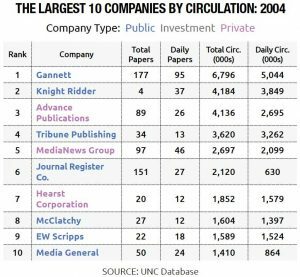 In 2004, the top five companies ranked by newspapers owned were Gannett, Liberty Group Publishing, the Journal Register Co., Community Newspaper Holdings and MediaNews Group. For Knight Ridder, Advance and their legacy newspaper peers, ink-on-paper publications brought in robust revenue and profit, a portion of which financed their mission as providers of news and information. In contrast, these three privately held investment entities — Liberty Group Publishing, CNHI and ACN — viewed newspapers as investments, pure and simple. Statements by these firms’ investment managers described small newspapers, most with circulation of less than 10,000, as reliable and consistent sources of income for their portfolios of diverse business assets. Small rural markets, they believed, would be relatively insulated in the coming years from competition — either from traditional media, such as television, or the internet, which was then still in its infancy. In 2004, these investment groups held 352 papers — or 20 percent of all the papers owned by the largest 25 companies. But because these companies had purchased small papers, they controlled only 7 percent of the circulation among the top 25 group. All that would change over the coming turbulent decade as other investment groups moved in, displacing the media barons that dominated the charts in 2004. For their part, Liberty Group Publishing and American Community Newspapers went through multiple iterations over the course of the decade as the investment firm managers reshuffled their portfolio, making numerous acquisitions and divestitures. After bankruptcy in 2009, American Community Newspapers ceased to exist, its newspapers sold off to other large companies by its creditors.22 After several financial restructurings, Liberty Group Publishing morphed into New Media Group/GateHouse. In 2014, only Community Newspaper Holdings Inc. existed much as it had in 2004, but with two dozen fewer newspapers. Hedge funds and pension funds also began betting on newspapers in the 1990s, seeing them as “safe” investments. Numerous institutional investors began acquiring stock in publicly traded companies — such as Knight Ridder and The New York Times Co. As the migration of readers and advertisers to the internet increased in the early years of the 21st century, many began agitating boards and executives of these chains to make changes or sell their newspaper empires. In the wake of the 2008–2009 Great Recession, the valuations of newspapers dropped almost overnight. Suddenly passive investors — hedge funds and private equity funds — decided it was time to buy newspapers. Since 2010, they have been acquiring papers at bargain basement prices and assembling large chains. Newspaper advertising revenue peaked in 2000 at $64 billion, adjusted for inflation. In the wake of the dot-com bust and the short recession that accompanied the 9/11 terrorist attacks, revenue declined sharply. By 2004, various institutional investors — including hedge and pension funds — had accumulated between 40 and 57 percent of the shares in publicly traded media companies.23 But each of the firms held only a small percentage of any company and were usually passive investors. The revenue plunge served as a wake-up call for hedge fund and pension fund managers, who began aggressively questioning newspaper executives about their digital strategies. Some lobbied boards of directors to “consider all strategic alternatives,” including sale of the company. In the years leading up to 2008, newspapers in small and mid-sized markets with very little competition typically sold for 13 times annual earnings. This meant that new purchasers needed to own a paper for at least 13 years in order to recoup their investment. 24 As entire legacy companies — such as Pulitzer and Knight Ridder — became available, other legacy companies became active bidders. In addition to paying a premium price to acquire a newspaper company, many buyers took on substantial debt. As the nation focused on a historic presidential election, and Wall Street and Main Street slipped toward a stunning downturn; 2008 turned out to be a pivotal year in newspaper ownership. The 2008–2009 Great Recession decimated the print advertising revenue of papers in both large and small markets. This paved the way for the transition of institutional investors from minority shareholders to outright owners and operators. At the beginning of 2009, the market capitalization of publicly traded companies such as Gannett, McClatchy and Lee had fallen more than 80 percent.29 As a result, newspapers were being valued by investment firms that typically arranged financing at only three to five times yearly earnings. This meant acquirers could potentially sell, or “flip,” a newspaper in three to five years and make a profit on the sale. Instead of the “buy and hold” strategy practiced by the legacy newspaper companies who had paid 13 times earnings before 2008, purchasers of newspapers since 2008 have been able “buy and sell” properties more frequently. Also, at substantially reduced sales prices, companies have been able to buy multiple newspapers for the same price they would have paid for only one previously. The total amount of money spent on acquisitions spiked in 2007, fell dramatically in 2008 and has hovered below 2004 levels since. Most of the major purchasers before 2008 took on substantial debt to pay for their acquisitions.30 As newspapers’ revenues and profits plummeted in the wake of the Great Recession, Lee Enterprises, Tribune Company and MediaNews Group, among others, were forced into bankruptcy proceedings by 2012. With the large legacy companies mostly shut out of the market, recently formed investment companies were well-positioned to purchase not only newspapers at bargain prices, but also entire companies that had filed for bankruptcy or were disposing of properties to pay down debt. Consequently, by 2012, the number of major newspaper acquisitions had rebounded to previous levels. But, because of the lower valuations of newspapers, the total dollars spent on acquisitions has been less than $1 billion in every year since 2007. In 2010, the trough year, only $149 million was spent. By 2012 sales bounced back to $643 million and reached a post-recession high of $827 million in 2015. More than a third of all newspapers — 2,906 — have changed ownership at least once since 2004. Newly formed investment firms — both privately held and publicly traded — have been the most aggressive purchasers since 2008. As a result, seven of the largest 25 newspaper companies by 2014 were investment firms. The path from 2004 to today has been a convoluted one, featuring high newspaper turnover, numerous company mergers and acquisitions, and new actors entering the fray. Ten of the 25 largest companies in 2004 were purchased either in full or in part by other companies. Six of the largest 25 companies in 2014 had not existed in their current form in 2004, including five investment firms. Six privately owned traditional newspaper companies grew enough to make the list, three other private companies dropped off the list and one (Suffolk Life Newspapers) ceased operations. Digital First Media, formed in 2011, was the second largest, with 208 papers. Community Newspaper Holdings Inc., formed in 1997, had 21 fewer papers than in 2004, but still ranked fourth with 128 papers. Sixth-ranked Civitas Media, formed in 2012, had 98 papers. Tribune Publishing was seventh largest, with 95 papers; it had gone through two corporate restructurings and a bankruptcy between 2008 and 2014. In all, seven investment entities ranked among the largest 25 newspaper owners in the country in 2014, including the 18th largest, 10/13 Communications, formed in 2009. 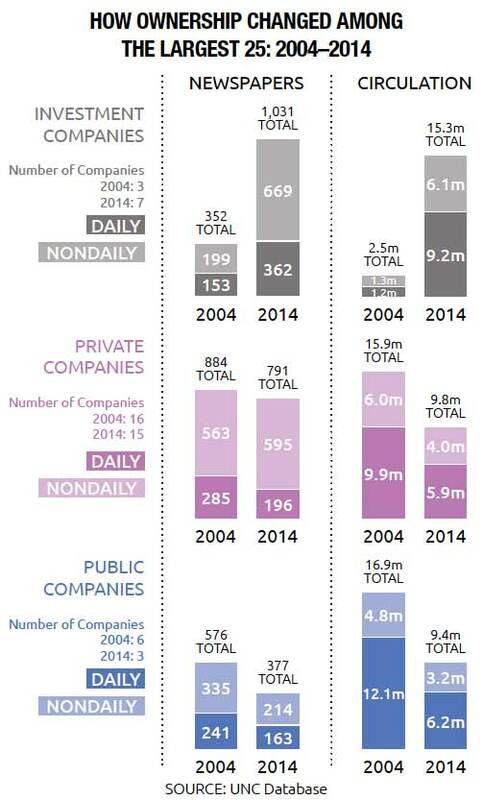 The seven investment entities owned twice as many dailies in 2014 as in 2004, and three times as many nondailies. They controlled six times as much circulation, expanding from 2.5 million in 2004 to 15.3 million in 2014. Consequently, ranked in size by circulation, four of the largest 10 newspaper companies in 2014 were also investment entities. Tribune Publishing was third, with 3.4 million. As investor ownership expanded, the number of large publicly traded companies declined from six to only three. By 2014, Knight Ridder, Pulitzer and Media General had been acquired by one of the other large companies. This left only Gannett, Lee and McClatchy among the 25 largest companies. Gannett remained the largest company as ranked by total circulation, and the third largest in terms of newspapers owned. Lee had become the fifth largest in terms of number of newspapers, and eighth largest in circulation. McClatchy was the fifth largest in circulation and 12th largest in numbers of papers. Overall, the number of newspapers owned by the largest publicly traded companies had dropped to 377, from 576, and the combined circulation had declined to 9.3 million, from 16.9 million. There was also turnover among the largest private chains. Some, such as Advance and Hearst, hunkered down and remained largely intact. Others, such as MediaNews and Suffolk, filed for bankruptcy and were purchased by investment firms or closed.33 Still, others—especially the small regional chains such as Boone and Rust—selectively acquired papers that came on the market in the post-recession years. As a result, the overall number of newspapers owned by the 16 largest private companies fell only slightly, to 791 in 2014, from 848 in 2004. However, combined circulation for the large private companies declined by a third—to 9.8 million. By 2014, the seven largest investment groups dominated both in terms of number of newspapers owned and total circulation. They owned 240 newspapers more than the 16 largest private chains and 654 more than the three publicly traded chains. Their combined circulation had grown from a paltry $2.5 million in 2004 to $15.3 million, surpassing the total circulations of both the large private and public chains. At the end of 2014, the seven largest investment groups owned 362 dailies and 669 nondailies. Almost 90 percent of their 1,031 newspapers were acquired after 2004, their largest transactions occurring between 2010 and 2012. Investment companies have aggressively sought to expand their newspaper portfolios over the past decade. Digital First, Civitas, BH Media and 10/13 Communications were all founded during the 2009–2012 period. New Media/GateHouse and Tribune emerged from bankruptcy in 2012 and 2013 and joined the pack in pursuit of more papers. Here’s a graphic presentation of how the companies grew, based on press releases and news accounts. 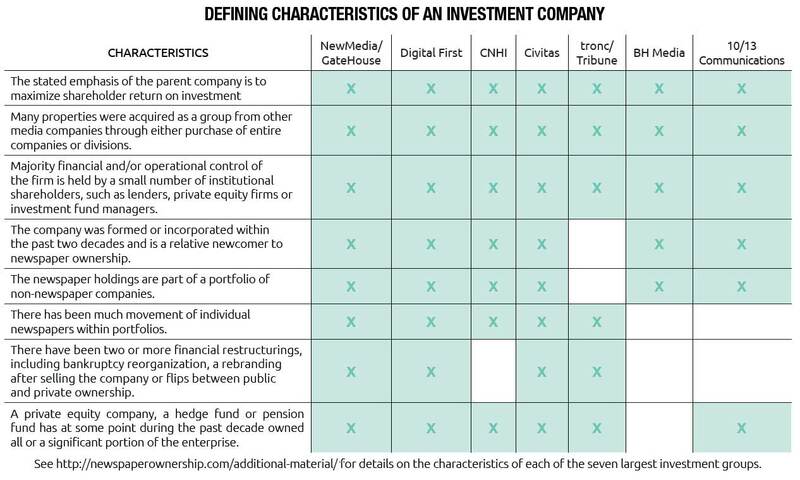 Large newspaper-owning investment entities have financial and corporate profiles distinctly different from the newspaper chains that preceded them. These investment firms are relatively new to owning newspapers and managing them. The newspapers they own are often part of a portfolio of non-newspaper properties, including real estate, retail establishments and financial services. Perhaps the biggest difference between the new newspaper barons and their predecessors is their pivot away from a long-term commitment to local journalism and the communities their newspapers have historically served toward a short-term investment and management strategy. In annual letters to shareholders, public statements by executives and press releases on their websites, the investment owners clearly acknowledge their laserlike focus on financial return. Many properties were acquired as a group from other media companies through either purchase of entire companies or divisions. Nine of the largest newspaper owners in 2004 were purchased in full or in part by investment firms. Majority financial and/or operational control of the firm is held by a small number of institutional shareholders, such as lenders, private equity firms or investment fund managers. Three are fully owned by private equity partnerships and one by a pension fund. In the three publicly traded companies, lenders or other types of institutional investors hold enough shares to determine the fate of the company. The company was formed or incorporated within the past two decades and is a relative newcomer to newspaper ownership. Five of the seven investment entities were formed in the past decade. The newspaper holdings are part of a portfolio of non-newspaper companies. The diverse business interests of these new newspaper owners include auto dealerships, real estate, financial instruments, distressed retailers, manufacturing firms and pharmaceutical and transportation companies, to name a few. There has been much movement of individual newspapers within portfolios. More than a third of all newspapers changed ownership in the past decade, many of which have been bought and sold two or more times. There have been two or more financial restructurings, including bankruptcy reorganization, a rebranding after selling the company or flips between public and private ownership. Four of the companies have filed for bankruptcy; two have flipped from either public to private or private to public. A private equity company, a hedge fund or pension fund has at some point during the past decade owned all or a significant portion of the enterprise. Four are owned either by a private equity fund, hedge fund or a pension fund. Two of the three publicly traded companies have been owned for at least a year by private equity funds. The American press exercises a freedom guaranteed in the Constitution. Newspapers have almost always been run as for-profit businesses, but with a special civic role in the nation and in their local communities. In turn, the public has an interest in the companies and people who exercise the freedom and power of the news media. It is very difficult to ascertain the intentions of the new newspaper owners. The websites of the newspapers they own invariably proclaim their commitment to public service journalism. Yet the press releases and publicly available material of the investment partnerships that own these newspapers focus on financial return for shareholders. In this context, the rise of new media barons raises questions of accountability and transparency: Who makes decisions on overall strategic direction and content of the newspapers these firms manage? What’s the structure of these newspaper-owning companies? Publicly traded newspaper companies are required to submit quarterly and annual reports with audited financial statements and management assessments of the business.37 Still, financial statements of the three publicly traded investment companies — New Media/GateHouse, BH Media and Tribune — are difficult to decipher, especially as they relate to the performance of their newspaper properties and their long-term strategy for them. In 2005, the private equity firm Fortress Investment Group (FIG) entered the newspaper business by purchasing the Liberty Publishing Group from Leonard Green & Partners, a Los Angeles-based investor. Fortress has $70.5 billion in assets under management and describes itself on the company website as “a leading, highly diversified global investment management firm” that “applies its deep experience and specialized expertise across a range of investment strategies — private equity, credit, liquid markets and traditional asset management — on behalf of over 1,600 institutional investors and private clients worldwide.” In 2006, Fortress took the Liberty Group Publishing public under the GateHouse brand. A year later, Fortress, itself, became the first large private equity company to list its shares on the New York Stock Exchange. In 2013, after purchasing the Dow Jones Local Media Group through Newcastle Investment, a company owned and managed by Fortress,39 GateHouse filed for reorganization through a pre-packaged bankruptcy. All newspaper properties were transferred into a newly created subsidiary called New Media Investment Group, also publicly traded.40,41 Fortress assumed the majority of the debt and management of New Media, and in return receives stock, stock options and a management fee of 1.5 percent based on the value of the stock. Some of the largest shareholders in New Media include Vanguard, T. Rowe Price and BlackRock.42 Since emerging from bankruptcy, Fortress, under the New Media/GateHouse brand, has continued to expand and has pledged to fund $1 billion in acquisitions through 2016.43 Today, New Media has a market capitalization of about $640 million, accounting for less than 1 percent of Fortress’ $70.5 billion in assets. Alden Global Capital, a privately owned hedge fund operator, founded Digital First Media in 2011 as a subsidiary that included newspapers in the MediaNews Group and Journal Register Co. Alden had assumed ownership of the MediaNews Group in 2010 and Journal Register in 2011 through bankruptcy proceedings. The Journal Register, which was the third-largest newspaper company in 2004 with 151 papers, had sold off more than half of its papers by the time Alden Capital assumed ownership. MediaNews and Journal Register were formally merged in 2013. Alden has also purchased outstanding debt from a number of private newspaper owners, including Freedom Communications. Digital First acquired The Orange County Register, owned by Freedom Communications, in bankruptcy proceedings in 2016. Because Alden is privately held, there is little available information on the finances of the company or its owner/founder, Randall Smith.44 In 2014, Alden announced its intention to sell Digital First Media. Two private equity groups — Cerberus Capital Management and Apollo Global Management — expressed interest in purchasing the company, but the deal for the entire company never materialized.45 Since then, Digital First Media has acquired Freedom Communications, while also quietly disposing of some properties. Recently, it has sold The Salt Lake (Utah) Tribune to Paul Huntsman, brother of former Gov. Jon Huntsman Jr., as well as its small papers in southern Vermont and northwestern Massachusetts to a group of local businessmen. CNHI was created in 1997 as a holding company for the Retirement Systems of Alabama to purchase newspapers. The Alabama retirement enterprise manages 23 investment funds. The income from CNHI makes up such a small portion of the diversified $36.6 billion investment portfolio that it is not broken out in annual reports. Since 2004, the company has made only small acquisitions, usually purchasing independently owned and operated papers in small markets. During the same period, it has sold or closed more than three dozen of its underperforming newspapers. In contrast to investment fund managers who are relative newcomers to the newspaper industry, Buffett’s experience dates back to the mid-1970s, when he purchased The Buffalo News and was appointed to the board of directors of The Washington Post Co., a position he held for more than two decades. This private investment firm, formed in 2009, is a partnership between 10K Investments, owned by two Reno, Nevada, businessmen, and 13th Street Media, owned by Randy Miller, who previously owned the Boulder (CO) Daily Camera before selling it to E.W. Scripps in 2005. 10K investor Arne Hoel has served on the boards of Swift Communications, which owns small newspapers in Colorado and California, and American Consolidated Media, which sold its 100 newspapers to Adams Publishing Group and New Media/GateHouse. Hoel’s partner, Brett Coleman, sold a residential construction company in 2005 and has no previous newspaper experience. Since its formation, 10/13 Communications has made three major acquisitions: Freedom Communications’ Phoenix assets, the Dallas operations of American Community Newspapers and ASP Westward’s Houston newspapers. The company also bought the ITZ Group, a digital consulting company, in 2013. Since 2014, the big chains have grown even bigger. Some legacy companies have re-entered the market and begun bidding against the investment groups. Most notably, in 2016, Gannett made two major purchases — Scripps/Journal Media and North Jersey Media. 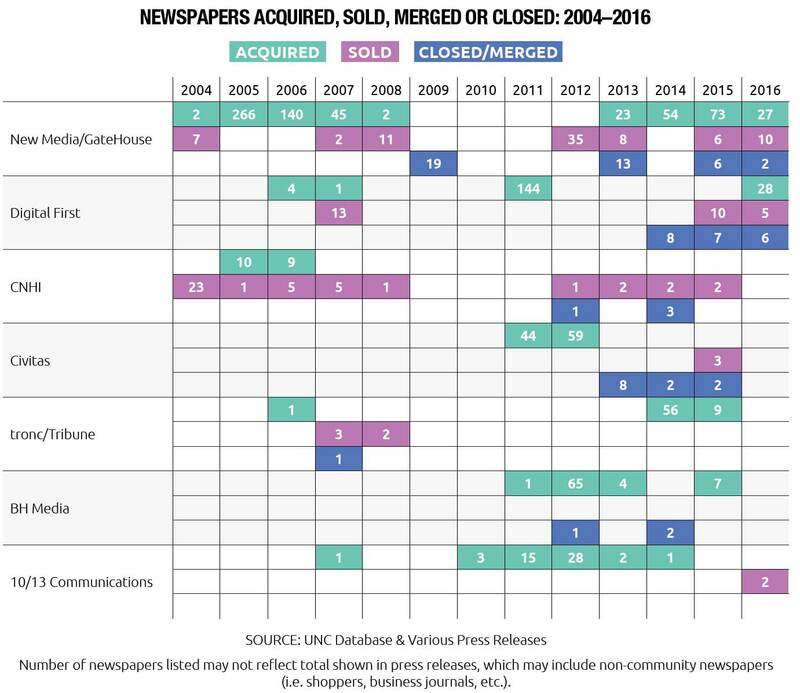 Meanwhile, New Media/GateHouse, Digital First and BH Media have continued to acquire newspapers and newspaper chains. The acquisition sprees of the largest companies have begun to raise questions. Among them: How big is too big? Are the measurements used to determine “monopoly” in a local market still valid in a digital era? What are the responsibilities of the owners of these large chains of newspapers to the communities where these papers are located? As of mid-2016, the three largest newspaper chains — New Media, Gannett and Digital First — own 898 newspapers, nearly twice as many as the three largest chains in 2004. They control a combined 12.7 million in circulation. New Media/GateHouse owns 432 papers in 32 states and controls 3.6 million in circulation. Gannett currently owns 258 papers in 34 states and has 5.2 million in circulation. In recent months, Gannett has made two unsolicited attempts to buy tronc/Tribune. If brought to fruition, such an acquisition would add 104 newspapers with 3.4 million in circulation to Gannett’s portfolio. Digital First owns 208 papers in 15 states and has 3.9 million in circulation. Two privately held newspapers companies — Adams Publishing Group and Boone Newspapers — were also active purchasers of small-market papers in 2015. Adams Publishing Group, a family investment fund formed in 2014 to buy and operate small newspaper chains in Ohio, purchased 24 community papers from Nash Holdings, which also owns The Washington Post.68 Adams now holds 52 papers. Boone Newspapers, which prefers to buy family- owned papers or small chains, purchased nine more papers and now owns 61 papers. If Gannett succeeds in acquiring tronc/Tribune, it will own 362 papers in 36 states and control 8.6 million in circulation — more than six times the circulation of the Wall Street Journal and more than twice the circulation of all the 432 papers owned by New Media/GateHouse. Digital First Media, which had submitted a lower bid than Tribune, then purchased Freedom Communications for $52.3 million from local owner Aaron Kushner, who had filed for bankruptcy. Consolidation usually occurs in a mature industry dealing with declining revenues and profit margins. The remaining firms attempt to achieve economies of scale with both costs and revenues. The large chains — including many of the legacy newspaper owners — assume that they need to own many papers in many regions to attract advertising and to hold down costs. This raises the question: Is consolidation the only answer, and will it pay the bills much longer if the industry does not develop new business models? It is difficult to predict if the fevered pace of the past decade will continue. Or if the new media barons — the large investment entities — will continue to be the dominant buyers and operators. They may choose to divest their newspaper holdings and move on to other more attractive options. The massive consolidation and reshuffling of ownership since 2004 has both short-term and long-term ramifications for communities that have historically depended on their newspapers to provide them with the news and information that strengthens democracy and capitalism at the local level. The larger the chains become, the more detached and disconnected newspaper owners become from the communities their newspapers have historically served. The next section, “The Emerging Threat of News Deserts,” considers what is at stake for both the industry and communities across the country. 11 Kathleen Drowne and Patrick Huber, The 1920s. (Westport, CT: Greenwood, 2004), 25. 12 Eli Noam, Media Ownership and Concentration in America, (Oxford: Oxford UP, 2009), 139. 13 Noam, Media Ownership and Concentration, 139-41. 14 Jennifer Saba, “Dealtalk-All the newspapers fit to be sold,” Reuters, March 25, 2013, http://www.reuters.com/article/newspaper-mergers-idUSL1N0CD82B20130325. 15 Davis Merritt, Knightfall: Knight Ridder and How the Erosion of Newspaper Journalism Is Putting Democracy at Risk, (New York: New York AMACOM, 2005), 26-8. 17 David Lieberman, “McClatchy to Buy Knight Ridder for $4.5 Billion,” USA TODAY, March 13, 2006, http://usatoday30.usatoday.com/money/media/2006-03-13-knight-ridder_x.html . 19 “CNHI Buys Herald, Allied News,” The Herald, Sharon, Pennsylvania, February 21, 2002, http://www2.sharonherald.com/localnews/recentnews/0202/ln022102a.html. 20 Jim Kirk, “Hollinger Will Sell Bunch Of Its Papers,” Chicago Tribune, November 25, 1997, http://articles.chicagotribune.com/1997-11-25/business/9711250339_1_hollinger-international-liberty-group-publishing-leonard-green. 21 “Bradley Family Builds Suburban Kansas City Cluster,” Dirks, Van Essen & Murray, December 31, 2005, http://www.dirksvanessen.com/articles/view/140/bradley-family-builds-suburban-kansas-city-cluster/. 22 Mark Fitzgerald, “And Then There Were 7: American Community Newspapers Files For Bankruptcy,” Editor & Publisher, April 28, 2009, http://www.editorandpublisher.com/news/and-then-there-were-7-american-community-newspapers-files-for-bankruptcy/ . 23 Noam, Media Ownership and Concentration, 6. 24 Jennifer Saba, “Dealtalk-All the newspapers fit to be sold,” Reuters, March 25, 2013, http://www.reuters.com/article/newspaper-mergers-idUSL1N0CD82B20130325. 25 Jacques Steinberg, “Pulitzer to Be Acquired by Lee Enterprises,” New York Times, February 1, 2005, http://www.nytimes.com/2005/02/01/business/media/pulitzer-to-be-acquired-by-lee-enterprises.html . 26 “McClatchy Completes Acquisition of Knight Ridder,” McClatchy, June 27, 2006, http://www.mcclatchy.com/2006/06/27/1629/press-releases.html. 27 Paul La Monica, “News Corp. wins fight for Dow Jones,” CNN Money, August 3, 2007, http://money.cnn.com/2007/07/31/news/companies/dowjones_newscorp/. 29 Alan Mutter, “Newspaper Share Value Fell $64B in ’08,” January 1, 2009, http://newsosaur.blogspot.com/2008/12/newspaper-share-value-fell-64b-in-08.html. 30 “Debt financing of newspapers in the post-recession era,” Dirks, Van Essen & Murray, December 31, 2013, http://www.dirksvanessen.com/articles/view/194/debt-financing-of-newspapers-in-the-post-recession-era/. 31 “Fortress Investment Group LLC to Acquire Liberty Group Publishing, Inc. From Leonard Green & Partners, L.P.,” PR Newswire, May 11, 2005, http://www.prnewswire.com/news-releases/fortress-investment-group-llc-to-acquire-liberty-group-publishing-inc-from-leonard-green--partners-lp-54369852.html. 32 Company Profile: BH Media Group. Bloomberg, 2016, http://www.bloomberg.com/profiles/companies/0699245D:US-bh-media-group-inc.
33 Emily Chasan, “MediaNews owner files prepackaged bankruptcy,” Reuters, January 22, 2010, http://www.reuters.com/article/industry-us-affiliatedmedia-bankruptcy-idUSTRE60M01920100123. 34 Warren Buffett, “2012 Letter to Shareholders,” Berkshire Hathaway, March 1, 2013, http://www.berkshirehathaway.com/letters/2012ltr.pdf. 35 Warren Buffett, “2014 Letter to Shareholders,” Berkshire Hathaway, February 27, 2015, http://www.berkshirehathaway.com/letters/2014ltr.pdf. 36 Ben Protess, Jessica Silver-Greenberg and Rachel Abrams, “How Private Equity Found Power and Profit in State Capitols,” NY Times, July 14, 2016, http://www.nytimes.com/2016/07/15/business/dealbook/private-equity-influence-fortress-investment-group.html?_r=0. 37 “Federal regulation of publicly traded companies,” Reporters Committee for Freedom of the Press, November 4, 2011, https://www.rcfp.org/sunshine-inc/federal-regulation-publicly-traded-companies. 39 (2016) Newcastle Investment Corp., Who We Are, accessed August 6, 2016, http://www.newcastleinv.com/about/index. 40 Marie Beaudette, “GateHouse Files for Chapter 11 Bankruptcy Protection,” Wall Street Journal, September 27, 2013, http://www.wsj.com/articles/SB10001424052702304526204579101353655855062. 41 Jon Chesto, “After Dow Jones deal, Fortress engineers GateHouse bankruptcy and media spin-off,” Boston Business Journal, September 04, 2013, . 42 Mark Howard, “Flipping newspaper ownership,” Florida Trend, February 26, 2015, http://www.floridatrend.com/article/18139/flipping-newspaper-ownership. 44 Rick Edmonds, “Who is investor Randall Smith and why is he buying up newspaper companies?” Poynter, July 27, 2011, http://www.poynter.org/2011/randall-smith-alden-global-capital-newspaper-companies/139962/. 45 Ken Doctor, “What are they thinking? Apollo’s acquisition of Digital First Media,” Politico, March 17, 2015, http://www.politico.com/media/story/2015/03/what-are-they-thinking-apollos-acquisition-of-digital-first-media-003573. 46 Michael Wursthorn, “Newly-Formed Newspaper Company Now ‘Less Leveraged’ After Consolidation,” Wall Street Journal, September 14, 2012, http://blogs.wsj.com/privateequity/2012/09/14/newly-formed-newspaper-company-now-less-leveraged-after-consolidation/. 47 “Versa Capital Finalizes Acquisition of The Wet Seal Retail Operations,” Business Wire, April 15, 2015, http://www.businesswire.com/news/home/20150415006789/en/Versa-Capital-Finalizes-Acquisition-Wet-Seal-Retail. 48 “About Versa Capital Management,” Accessed August 06, 2016, https://www.linkedin.com/company/versa-capital-management. 49 “Target Criteria,” Versa Capital Management LLC, Accessed August 06, 2016, http://www.versa.com/target_criteria.php. 50 Michael Oneal and Steve Mills, “Part One: Zell’s Big Gamble,” January 13, 2013, http://articles.chicagotribune.com/2013-01-13/business/ct-biz-trib-series-1-20130113_1_sam-zell-randy-michaels-big-gamble. 51 “Tribune files for bankruptcy,” NY Times Dealbook, December 08, 2008, http://dealbook.nytimes.com/2008/12/08/tribune-files-for-bankruptcy/. 52 Robert Channick, “Dold named Chicago Tribune publisher, Ferro donates Sun-Times stake to charitable trust,” Chicago Tribune, March 02, 2016, http://www.chicagotribune.com/business/ct-tribune-publishing-changes-0303-biz-20160302-story.html. 53 “Tribune Publishing Receives $70.5 Million Growth Capital Investment from Nant Capital,” Business Wire, May 23, 2016, http://www.businesswire.com/news/home/20160523005650/en/Tribune-Publishing-Receives-70.5-Million-Growth-Capital. 54 “BRK/A: New York stock quote - Berkshire Hathaway Inc.,” July 12, 2016, http://www.bloomberg.com/quote/BRK/ A:US. 56 Anupreeta Das, “At Papers, Berkshire Rewrites Its Script,” Wall Street Journal, January 2, 2014, http://www.wsj.com/articles/SB10001424052702304361604579292721064856870. 57 Rem Rieder,“ Newspapers haven’t ‘cracked code,’ Buffett says,” USA Today, May 28, 2016, http://www.usatoday.com/story/money/columnist/rieder/2016/05/25/rieder-newspapers-havent-cracked-code-buffett-says/84902818/. 58 Howard Stutz, “Review-Journal, parent Stephens media to be sold to New Media,” Las Vegas Review-Journal, February 19, 2015, http://www.reviewjournal.com/business/economy/review-journal-parent-stephens-media-be-sold-new-media. 59 “Gannett Board Approves Completion of Spin-off Transaction,” Business Wire, June 08, 2015, http://www.businesswire.com/news/home/20150608005985/en/Gannett-Board-Approves-Completion-Spin-off-Transaction. 61 “Gannett acquires 11 media organizations from Digital First Media,” Gannett, June 01, 2015, http://www.gannett.com/news/press-releases/2015/6/1/gannett-acquires-11-media-organizations-digital-first-media/. 62 Lisa Beilfuss, “Gannett Buys Assets from North Jersey Media Group,” Wall Street Journal, July 06, 2016,http://www.wsj.com/articles/gannett-buys-assets-from-north-jersey-media-group-1467836611. 63 Jonathan Lansner, “Digital First closes deal to buy The Orange County Register,” Orange County Register, March 31, 2016, http://www.ocregister.com/articles/digital-710434-first-register.html. 64 “Digital First Media to Sell the Salt Lake Tribune to Paul Huntsman,” Business Wire, April 20, 2016, http://www.businesswire.com/news/home/20160420005948/en/Digital-Media-Sell-Salt-Lake-Tribune-Paul. 65 Gerry Smith, “Newspapers Gobble Each Other Up to Survive Digital Apocalypse,” Bloomberg Technology, March 29, 2016, http://www.bloomberg.com/news/articles/2016-03-29/newspapers-gobble-each-other-up-to-survive-digital-apocalypse. 66 Andrea Chang, “Tribune Publishing completes purchase of U-T San Diego,” Los Angeles Times, May 21, 2015, http://www.latimes.com/business/la-fi-tribune-san-diego-20150522-story.html. 67 Matthew Ingram, “Tribune Rebuffs Gannett Again, Gets Sued, Changes Name to Tronc,” Fortune, June 2, 2016 http://fortune.com/2016/06/02/tribune-gannett-tronc/. 68 “Flurry of end of year sales caps off a very active market in 2015 for newspaper transactions,” Inland Press Association, December 29, 2015, http://www.inlandpress.org/industry/article_f036dc5e-ae4e-11e5-8764-07f17e9e00d1.html. 69 Beau Yarbrough, “Judge halts sale of Register, Press-Enterprise to Tribune Publishing,” Los Angeles Daily News, March 18, 2016, http://www.dailynews.com/business/20160318/judge-halts-sale-of-register-press-enterprise-to-tribune-publishing.